In May 2002, sixty students of Lama Zopa Rinpoche had the once-in-a-lifetime opportunity to go on pilgrimage with Rinpoche to Tibet. Ven. Sarah Thresher wrote about this extraordinary journey for Mandala. In her 10-page story, Ven. Sarah captured the inspirational teachings given by Rinpoche explaining the purpose of pilgrimage, as well as the hardships and uncertainty faced by pilgrimages traveling in Tibet at that time. Rinpoche began explaining how to get the greatest benefit from holy objects when you visit a temple. We did prostrations, made offerings and prayed while taking blessing from the scriptures, statues and so forth. This was to become a familiar procedure. On that whole trip I never saw Rinpoche pass by a holy object without making prostrations, offerings, prayers and extensive dedications and we tried to do the same. You can read the entire article “Pilgrimage to Tibet,” published in Mandala December 2002-February 2003, as a PDF. 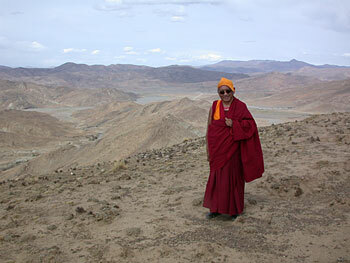 The 2002 pilgrimage to Tibet with Lama Zopa Rinpoche was also documented by filmmaker Christina Lundberg in her 2007 film Mystic Tibet.